Porta Power Australia has been involved in the BOOSTER PACK supply industry for over 30 years with extensive experience and technical knowledge to back up its product. We source our product from European and American manufacturers, who are rated as the top manufacturers in their field. Porta Power Australia has, and never will, have any involvement with inferior products. Top of the range powerful and purposely built AGM, pure lead, deep recovery batteries are used in all our units. Maximum power transfer through industrial grade cables and clamps to penetrate corroded battery terminals. Pure, raw portable power (Porta Power Australia) delivering top Cranking Amps to the required source puts us fields above our competition. Porta Power Australia and “Booster Pac” were the originals in the Australian market and are still the leaders in our field. Proactive technology allows us to stay ahead of the market with innovative design and performance to meet the Australian market demands. This includes rugged outer casing to protect the product, and equipping our more powerful units with fuses and buzzer warning systems to help prevent the possibility of cross polarization and damaging the batteries. 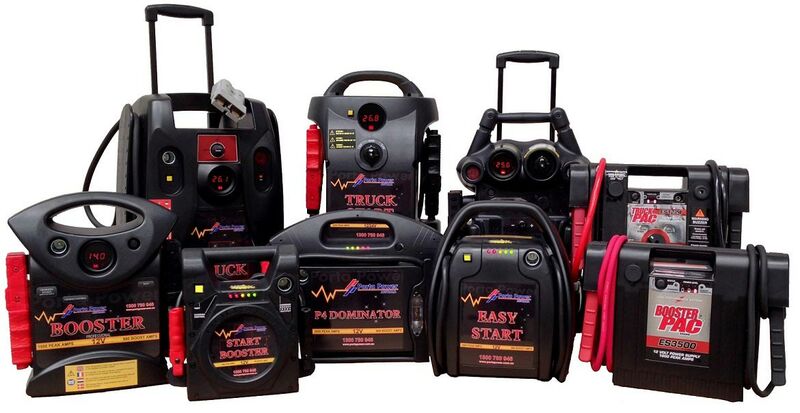 Product range from 1400 Peak Amps through to the impressive 6200 Peak Amp Jumpstarter. From the backyard mechanic to the professional trade mechanic, high compression, high performance vehicles through to the range of truck / bus start models to the model approved by the Australian Armed Forces. Starting all vehicles including tanks, and finally to the BOOSTER PACK that will start any motor including helicopters / mining dump trucks etc, in fact this BOOSTER PACK has now the power to operate a MIG welder from its source. PORTA POWER AUSTRALIA servicing the Australian market with quality BOOSTER PACKS for over 30 years.